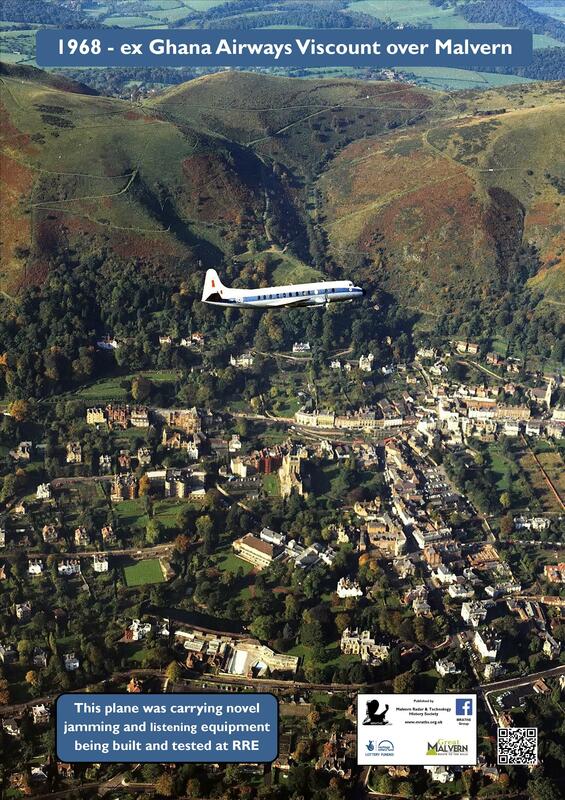 The Vickers Viscount seen here flying over Malvern on November 18 1968 was an aircraft from a large fleet of trials aircraft operated by RRE’s Aircraft Department. At the time of the photo, RRE’s aircraft were based at Pershore airfield (nowadays often wrongly called Throckmorton airfield). This airfield was the home of the establishment’s Aircraft Department between September 1957 and July 1977, when its rundown to closure was completed. The Department previously had control of Defford airfield from late May 1942 (when its aircraft were transferred to Worcestershire from their previous Dorset base) until September 1957. This Viscount was one of a fleet of three Type 838 Viscount airliners bought new by Ghana Airways in September 1961 and used by that airline until January 1965. 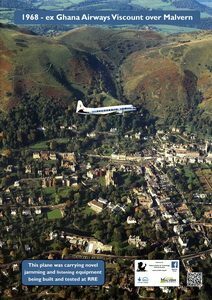 At that time, RRE had a particular requirement for a Viscount to be added to its fleet. RRE’s controlling government ministry was then the UK Ministry of Technology (MinTech). The aircraft was available for sale and it was purchased for RRE, by MinTech, and delivered to RRE Pershore in late January 1965. On arrival, it lost is Ghanaian civilian identity (9G-AAV), and then, like the other RRE aircraft, it became part of the very large MinTech Controller of Aircraft fleet, it acquired a military identity (XT661). RRE’s requirement for a Viscount arose from the establishment’s need to replace its existing Handley Page Hastings ECM (electronic countermeasures – also called ‘radar jamming’) aircraft (identify TG514). As a type, the Hastings had been in service as a utility military transport with the RAF since 1948, and eight of them modified into specialised radar trials aircraft gave good service to RRE between 1953 and 1974. By the 1960s it was an obsolescent type, and the Viscount was assessed as suitable for modification into a replacement for TG514. Compared with the 1940s design of the Hastings, the Viscount had a generally much improved performance, its pressurised fuselage enabling operation at higher altitudes: the airliner standard interior offered a quiet and comfortable working environment for the flight deck crew and for the ‘boffins’ operating the radar equipment now installed in the cabin previously used by passengers. Like scores of other other aircraft modified for radar trials use by RRE and its predecessors, the conversion of XT661 from a passenger airliner into a powerful flying jamming system was undertaken by the Aircraft Department. While the aircraft’s structural modifications were designed, manufactured and installed at RRE Pershore, the electronic design and manufacture of the jamming system was undertaken at RRE’s main site at Malvern. Modification of the aircraft was a complex job. It was required to have antennas in both its nose and tail for the radar jammer transmitter, but the nose was already the location for the aircraft’s weather radar (important for flight safety). This problem was solved by the design and manufacture of a pod, attached to the under surface of the fuselage, to house the antennas. Redesign and upgrading of the aircraft’s electrical system was also required as the electrical system could not supply sufficient electrical power for the powerful transmitters. ECM is a technology used by all military forces to negate, or to mislead, the radar systems of their adversaries. In contemporary times, ECM has developed into a very sophisticated electronic science. The equipment in XT661 was more basic. Its basic function was to test the sensitivity of UK military radar equipments to simulated enemy jamming. In this role, the aircraft could be flown versus all types of radar systems – e.g. the ground-based air defence radar network, the air defence radars of Royal Navy ships, Army and RN guided missile system radars, airborne interception radars of fighter aircraft. This very wide requirements base required that the signals transmitted could be selected to be on a number of widely differing radar frequencies and this, in turn, required duplication of the radar transmitters and other equipment in the aircraft.